During the winter months, plowing and salting city streets, country roads and highways is a critical service delivered and managed by local government departments. The safety of residents and visitors is dependent on roads being quickly cleared and regularly maintained by fleets of vehicles and drivers. Winter fleet managers not only have the responsibility of ensuring roads are clear and safe, they’re also tasked with managing costs, ensuring environmental compliance and optimizing the performance of their workers, assets and fleets. SkyHawk’s Winter Operations solution utilizes GPS technology, specifically designed for mixed fleets, to enable fleet managers to effectively and efficiently deploy, monitor, and manage fleets of vehicles, drivers, assets and materials. The solution is unique, as it supports a wide range of spreader controllers and sensors (e.g. plow & wing blades, air and road temperature) and provides specialized reports for winter operations. 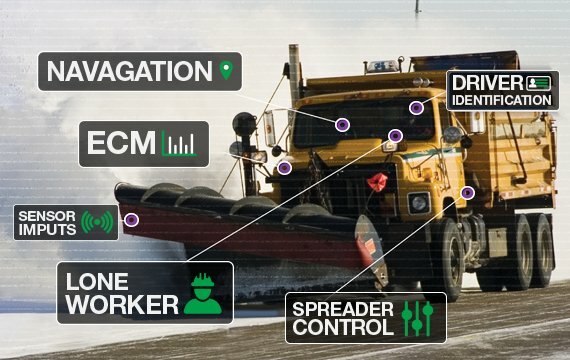 As well as having real-time visibility into the location and performance of drivers and vehicles, and the current status of snow removal, SkyHawk’s Winter Operations solution enables fleet managers to easily monitor overall operating costs, spreading frequency, materials used, and environmental and performance compliance. Improve your winter fleet operations, better manage costs and budgets and keep roads safe and clean this winter with SkyHawk’s Winter Operations solution.